Colour: Navy. About KJ Beckett. This does not affect your statutory rights. Statutory Rights. 100% Authentic Lacoste. U:190391801215|Style:RK3550|Rep:|schart:|Minutes:1|Am:create. Style: Baseball Cap. Material: Polyester |. Material: Polyester. Size: One Size. Size:One Size. Hats in Size One Size. This will give you your bust size. Regular, Short and Long leg lengths: Unless specified, all denim and trouser legs are regular length. SIZING One size fits all. Need help?. - Longer leg jeans and pants are denoted by an 'L' in square brackets:[L]. Regular, Short and Long leg lengths: Unless specified, all denim and trouser legs are regular length. This will give you your bust size. - Longer leg jeans and pants are denoted by an 'L' in square brackets:[L]. This will give you your bust size. Regular, Short and Long leg lengths: Unless specified, all denim and trouser legs are regular length. Need help?. - Longer leg jeans and pants are denoted by an 'L' in square brackets:[L]. This Lacoste Sport Baseball Cap is 100% polyester and is blue in colour. Style Code: RK2447 AD0. 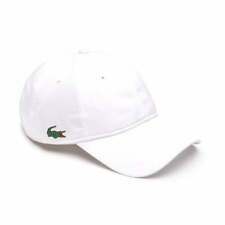 This Lacoste Sport Baseball Cap is 100% polyester and is white in colour. • Adjustable Strap. • 100% Polyester. This Lacoste Sport Baseball Cap is 100% polyester and is navy in colour. • Adjustable Strap. • 100% Polyester. Complete your look with this Classic Cap from Lacoste. Finished with the iconic Croc logo; a symbol of casual style and effortless elegance. 100% Polyester. Lacoste Sport baseball cap hat. 100% Authentic Lacoste. U:190391801215|Style:RK3550|Rep:|schart:|Minutes:1|Am:create. Style: Baseball Cap. Material: Polyester |. Material: Polyester. Size: One Size. Hats in Size One Size. Inventory Number:6112-0487. Luxury and Lightweight Micro-Fibre Breeze Sports Large Signature Motif Cap - Below RRP. RRP £40.00. Effortlessly cool and comfortable, light micro-fibre baseball style cap with six-panel construction design. SWIM & BEACH WEAR. ROLL NECKS. JACKET & COATS. Made from 100% polyester. Why Buy From Us?. POLO SHIRTS. You Save £7.00. RRP £35.00. This hat needs no introduction. · Machine Wash. · Embroidered logo on front. · 100% Polyester-twill. · Adjustable closure. Lacoste RK2447 Sports Cap Royal Blue - BNWT. Condition is New with tags. This Lacoste Sport Baseball Cap is 100% polyester and is black in colour. • Adjustable Strap. • 100% Polyester. Style: RK8217 51 132. Signature Green Croc Appliqué. Perfect for playing doubles or just kicking around town, this lightweight cap blocks the sun with classic sport style. 100% Polyester. Color: GREEN. 100% Authentic Lacoste. U:190391801215|Style:RK3550|Rep:|schart:|Minutes:1|Am:create. Style: Baseball Cap. Material: Polyester |. Material: Polyester. Size: One Size. Inventory Number:6112-0487. Size:One Size. ATHLETIC TENNIS LIGHTWEIGHT SPORT CAP. 100% POLYESTER. SIGNATURE CROC APPLIQUE AT FRONT. Lacoste Men's Classic Croc Logo Sport Adjustable Hat Cap Polyester Black. Condition is Pre-owned. Shipped with USPS First Class Package.